I had to ponder about this long walk for a while, and see what thoughts it generated in my head when looking back through my photographs of the journey. When I finished the Wessex Ridgeway I didn’t get the feeling of satisfaction I normally have at the end of one of my long distance paths. It was more a feeling of ‘well that didn’t turn out as I thought it would’. I did enjoy the journey, as with all of the long walks it’s a discovery of paths and landscapes new to me every day. It wasn’t at a high level and most of the ascents and descents were steady, and even the steep bits weren’t too bad. It’s not a route that has been over walked, and some days it was definitely the path less trodden – very overgrown in places, but some of this is due to the fact that there is an easily accessible track adjacent to the route. I did wander away from the official Ridgeway for accommodation reasons and also to visit different places such as Cerne Abbas. I also started the walk at Avebury rather than Marlborough to reduce my mileage on the first day and to allow myself a wander around the henge, and I’d definitely recommend doing that. There isn’t a great Ridgeway to follow and it’s a bit misleading as it doesn’t always stick to the high ground. On the ground itself be prepared for walking along a lot of bridleways, metalled tracks, old green lanes, much cow pasture, and multiple fields. Depending on what time of year it is in relation to the farming calendar it could be really difficult to pass through some of the crops as they mature. For this reason a walk in spring or late summer is probably the best option. I was lucky once more with the weather as it was dry for 9 days, and I did wonder how muddy it would get given that there is a lot of 4x4 trails along the route. As always logistics played a part in planning the route and I have not stuck religously to the waymarked route, I’ve wobbled about a little to ensure I have somewhere to stay every night along the way. Dorset is a bit of a ‘honeypot’ for tourism and as such the B&amp;B’s are generally fairly busy, especially at weekends, which accounts for some of the wobbles as first choice of B&amp;B was not available. It took sometime and a good placement of my car to figure out how to do this in the most efficient way. I was visiting family in Cornwall the week before my walk. 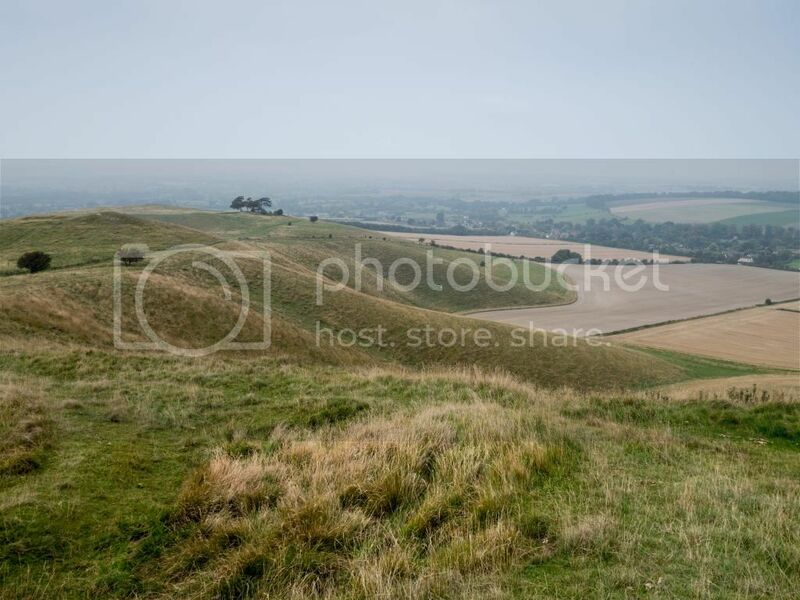 I have been looking around the web a little but there isn’t too much information out there, one of the sites I’ve enjoyed is about Avebury past and present and it will help make my trip there the more enjoyable – <a href="http://www.avebury-web.co.uk/">http://www.avebury-web.co.uk/</a></p><p>Plan A is for fine weather but after all the dry weather I had on Anglesey, I’m hoping it’s not payback time – I may carry a large brolly with me if the forecast is inclement weather. I did this once before when walking Hadrians Wall and it was successful, mainly because it wasn’t too windy. We shall see…</p>I shall drive down to Cornwall to see family for a few days, then drive up to Cattistock to park my car at one of my B&amp;B’s. Walk to Maiden Newton to catch a train up to Bath and on to Swindon, which will be a pleasant little journey through the countryside. I quite like a train journey now and again as long as they aren’t too long. Off the train at Swindon and onto a bus down to Avebury, and walk a mile or two to my B&B. After a mooch around Avebury and it’s surrounds the walk will start properly, take me 9 days, and fits very nicely into 15 or 16 mile chunks. I shortened the first day so I could have an easy warm up and a relaxed start, and preferred to start from Avebury rather than Marlborough. I used memory map to plan out my routes and rather successfully managed to keep fairly even mileage over the whole route – time will tell how many diversions will be added.